Stylin in St. Louis: Bloggers Who Budget: White Out…. Bloggers Who Budget: White Out…. Happy Monday! Hope you had a great weekend! Hard to believe that July is almost over! My summer break is coming to a close! How can that already be? 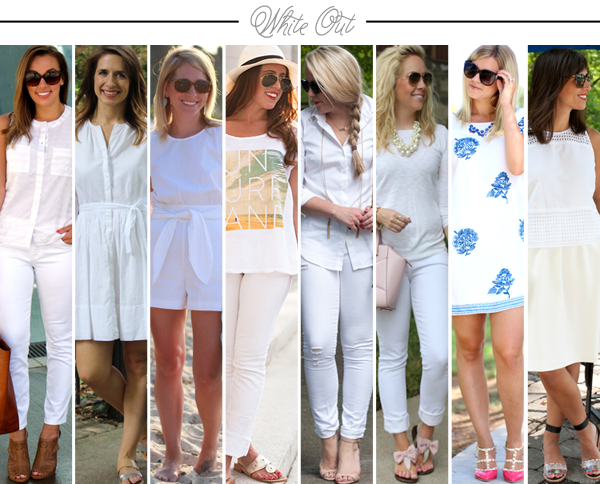 This monday, bloggers who budget is taking on the color white! I love white in the summer and white in the winter! This is a super comfy outfit! Stretch jeans and light weight sweater! Perfect for cold office buildings! Be sure to check these other amazing bloggers! adore your flats, love this all white look. I am drooling over those shoes!! Bows really are the best :) such a great summery look! Happy Monday! The bow sandals are adorable with this look! I love the all white!! its so clean and classic and always looks fresh!! I love your bow bag too! I love white on white so much! I have never tried it myself though. Surprisingly I feel like I have next to none plain white clothing! I love the all white with the blush- so pretty! How stinkin' cute are your sandals! So cute! And I love the pink KS bag and those cute little bow sandals!! Head to toe this is amazing! You could not be any cuter! SO adorable! Love the all white. And those shoes are too cute! The matching bows on your bag and sandals are just too cute. You look so summery and ladylike!